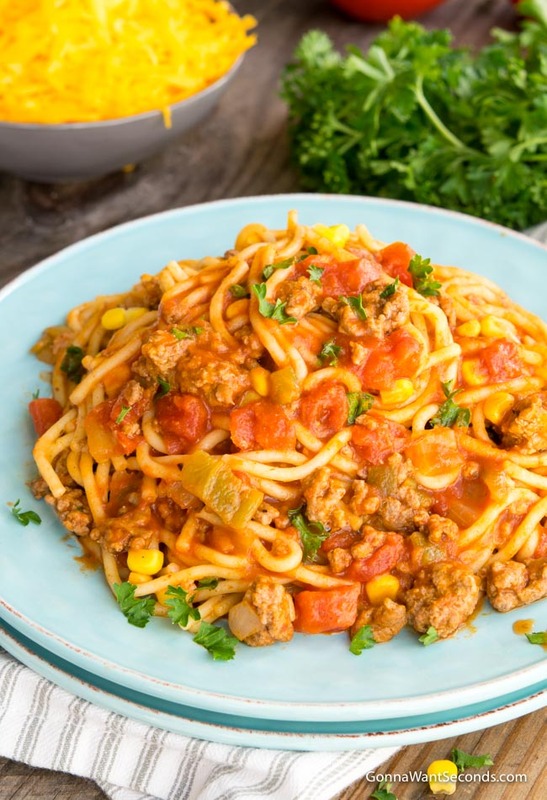 Mexican Spaghetti, one of my favorite one-pot wonders, adds a little “spice” to your dinner table and shaves valuable time off a busy weeknight. 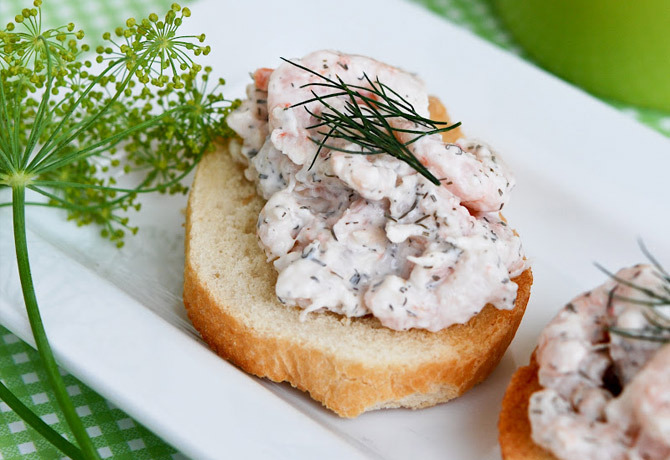 Don’t you just love collecting good recipes? Maybe you’re obsessed with the top secret ones you’ve bribed restaurant owners for, or the old, stained, hand-written family recipes uncovered in dusty attics or the complicated additions to your bulging recipe box of show-stopping sweets (for that bakery you’re determined to open someday). Me, I love them all, but I’m particularly fond of ones that make me a weeknight warrior, the recipes that miraculously create a spectacular meal in one – count ‘em ONE – pot, and in under 30 minutes. 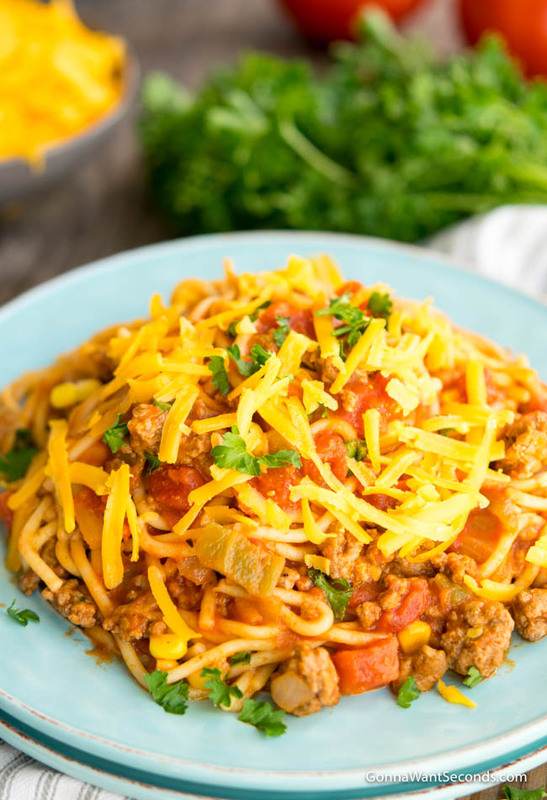 This Mexican Spaghetti recipe, also called fideo, is one that gets pulled out of the recipe box pretty frequently at my house (though I really don’t need the recipe anymore at this point, LOL), and you’ll definitely want to add it to your one-pot repertoire! Fideo means “noodle” in Spanish, and authentic Mexican spaghetti is cooked using the pilaf method, similar to Mexican rice, where the noodles are toasted, sautéed a bit with aromatics, then cooked in a mixture of tomatoes, water or broth, and Mexican spices. There’s also a version that’s a tomato-free Mexican spaghetti with sour cream and ham – espagueti a la crema con jamón. My version adds green chilies, corn, hearty ground beef, all with a generous sprinkling of cheese melting on top. I suppose the thing that makes Mexican spaghetti fideo is that toasting step, which I skip in my recipe since it tends to make the final dish a little greasier than I’d like, but it still has all the robust flavors you’d expect from mixing Italian and Mexican cuisines. It basically has all the ingredients of a savory Mexican spaghetti casserole (and you know I’m a die-hard fan of spaghetti casseroles if you’ve ever tried my Million Dollar Spaghetti), but it all comes together on the stovetop! 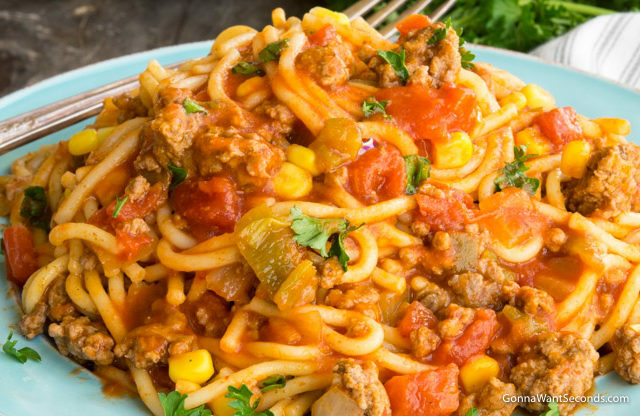 How do you cook Mexican spaghetti? 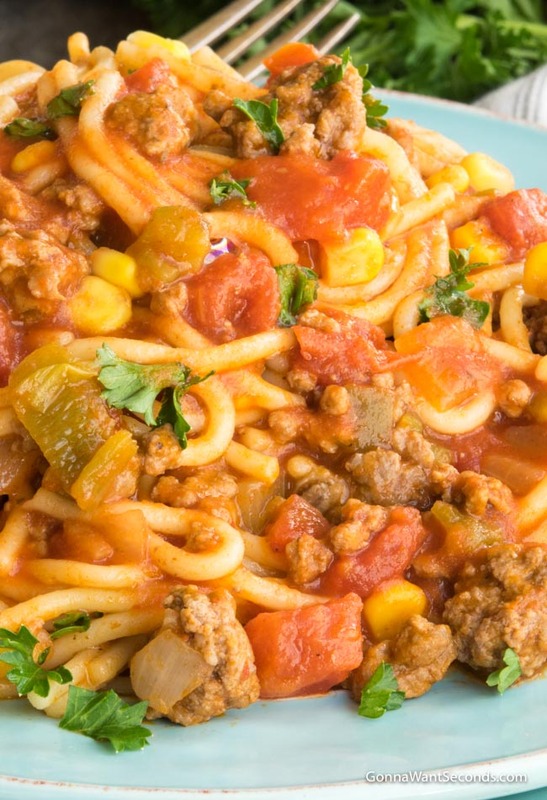 This easy Mexican Spaghetti recipe starts by sautéing diced onions with ground beef. The standard ground beef blend (70% lean to 30% fat) will work here, or even a nice ground chuck. Just make sure you drain the grease off once everything’s brown so we can avoid that “greasy” problem I mentioned earlier. Next, we’ll build the flavorful base to cook the pasta in. The Mexican Spaghetti sauce has tomatoes, of course, and I use a combination of diced tomatoes (with their juice!) and tomato sauce. That means we’ll have nice bright bites from the big red fruit, as well as some velvety, more subtly acidic sauce to help thicken everything. I also like to add a little corn for a touch of sweetness. Now for the seasoning and the “Mexican” part of this spaghetti! I start with a packet of taco seasoning mix. This is one of my favorite store-bought time-savers to keep on hand because it literally has some of every-thing you need to make a Mexi-anything! Onion, garlic, cumin, chili powder, paprika, oregano . . . I have several packets in my pantry at all times for taco emergencies. Canned green chilies are the next ingredient on the list and the one that adds just the right amount of spiciness to this dish. I like to use Hatch chilies sometimes too, and, because I do like things spicy, I’ve been known to throw in an extra can to bump up the heat a bit. All that’s left is the spaghetti, broken into bite-sized pieces, and some water to thin the sauce enough to offset the amount the pasta absorbs during cooking. This stovetop method is one of the most brilliant ways to cook pasta since it saves the extra step of pre-boiling it in a separate dish (you know, another dish that will need WASHING), but it also means instead of just salted water the pasta will absorb all the other flavors going on in this dish. The sauce will look a little thin at this point, but it’ll thicken up as the noodles expand and soften and some of the starch seeps in to thicken it. Every spaghetti needs cheese, even Mexican spaghetti. This isn’t a creamy, cheese-loaded dish like some of the Mexican spaghetti Velveeta Rotel versions (similar to my Chicken Spaghetti but with beef). Instead, we’ll add it as a gooey garnish once the pasta’s perfectly tender. 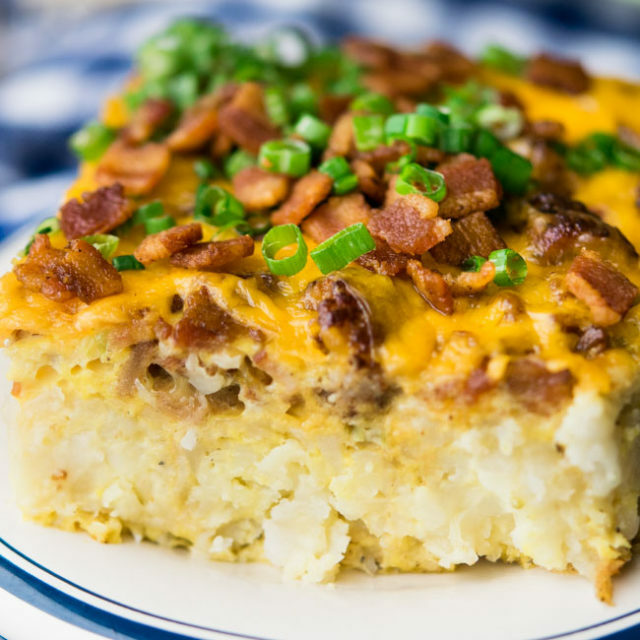 With all the strong seasonings in this dish, I prefer to complement them with a nice medium to mild cheddar sprinkled on top, rather than having big rivers of cheese running through it. I do like to change things up a bit occasionally and use a pepper jack cheese instead of the cheddar, which is slightly creamier and adds a little more heat (bring on the caliente!). Have you heard of this crazy thing called spaghetti tacos? I’ll admit it seemed a little strange to me at first to think about stuffing crispy corn tortilla shells with spaghetti, but it actually really works with this Mexican-flavored spaghetti recipe! After filling your taco shell, you can top the Mexican Spaghetti with sour cream, chopped avocados, lettuce, or salsa . . . basically anything you’d top a beef taco with. I love this Mexican Spaghetti recipe because it truly couldn’t be simpler and even picky eaters will call this one “a keeper.” If you don’t mind washing one more dish, you can always serve a green salad on the side (with a nice cilantro, lime vinaigrette, YUM! ), though it’s really a nice meal on its own. 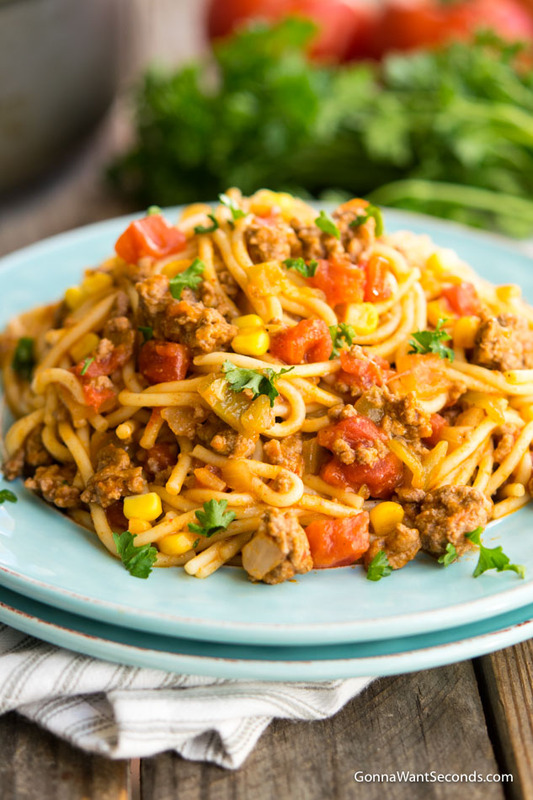 All it takes is a little Italian/Mexican fusion to marry taco night with everyone’s favorite pasta and create everyone’s new favorite weeknight meal! 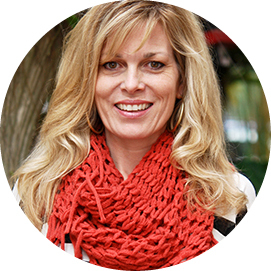 Let’s talk turkey – Not a ground beef fan or just want to lighten things up a bit? 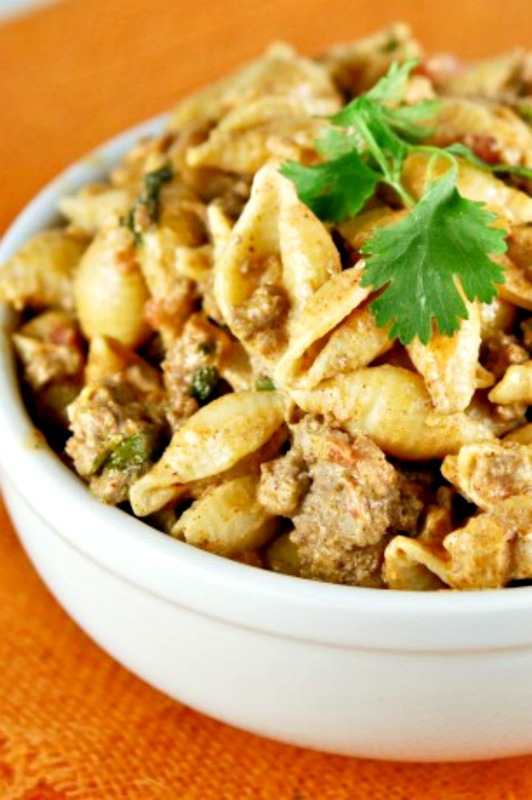 You can easily substitute ground turkey or chicken in this recipe. You can also use leftover chicken chunks (or a store-bought rotisserie chicken) to make this a Mexican chicken Spaghetti. 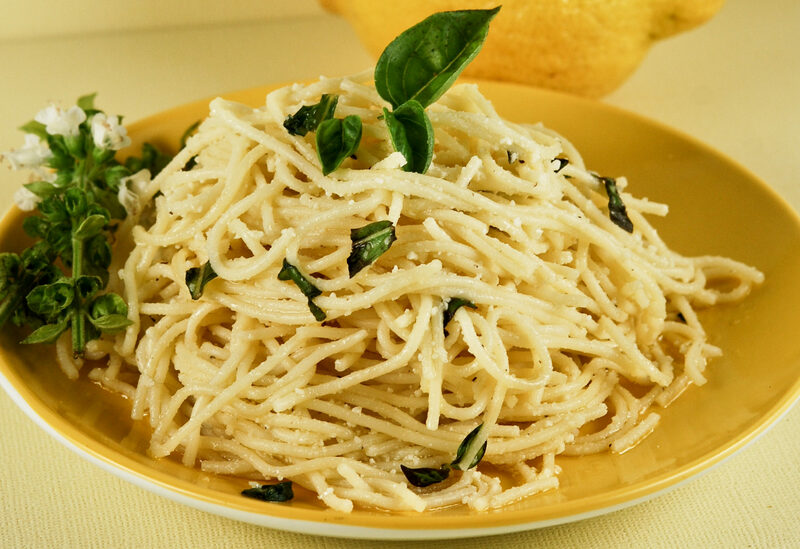 Picky about pasta – A gluten-free or whole wheat pasta works well in this dish, though you may need a touch more water and cooking time if you go the whole wheat route. If you’re really watching your carbs, you can use spiralized zucchini noodles or make a Mexican spaghetti squash version. Just omit the water in the recipe and cook the sauce long enough for the flavors to meld. Toss it with steamed spaghetti squash shreds or blanched veggie pasta instead of actual spaghetti. Seasoning mix savvy – If you use taco seasoning mix as much as I do, it might be worthwhile to make up a big batch from scratch to keep on hand. There are lots of recipes to choose from online, and you likely have all the ingredients in the pantry already. The homemade version gives you the flexibility to adjust the seasonings to your liking, perhaps lowering the salt, for example, or bumping down (or up!) the heat. 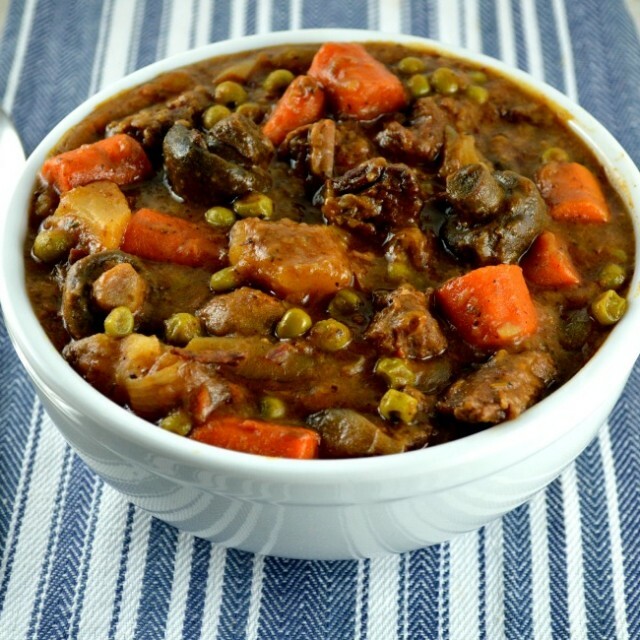 If you have a homemade mix to substitute in this recipe, you’ll need about 2 Tablespoons to equal a packet. In a large skillet over medium heat, brown beef, and onion until there is no longer any pink in the beef. Drain off any fat. Stir in taco seasoning, green chilies, diced tomatoes, corn, tomato sauce, and water and bring to a boil. Stir in noodles. Reduce the heat and simmer, covered, for 20-25 minutes or until the pasta is al dente. Wonderful recipe. Added cilantro, some salt and pepper. Loved how the pasta cooks in it. Thanks for sharing. This was delicious! I added fiesta corn, green pepper, cumin, and spicy spaghetti sauce! This will be on the menu for another delicious dinner! Hi Carrie! Yay, glad you like this! Your tweaks sounds perfect! This was delicious. I added a little cilantro, salt and pepper. Convenient that the pasta cooks in it instead of having to make separately. There were no leftovers and we had salad and cornbread with it!!! This was so good!! My family tore it up!!! I can’t wait to try this tonight! I’m going to try it with half of the tomatoes and half of Rotel 🤯. 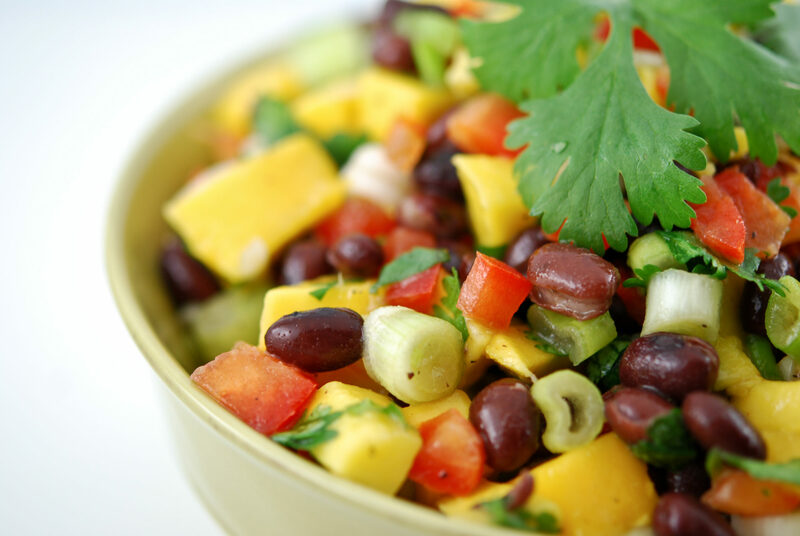 Hubby and I love spicy food (Mexican is our FAVORITE) and your recipie sounds delicious! Thanks for sharing! Hi Robert. Hmm. Are you referring to the sauce? I’d love to help. Please let me know. Hi. When you say 18 ounce tomato sauce is it 18 or one 8 ounce. Same with dice green chilies it says 17. Love the twist ! Thank you !